The city of Lafayette was founded by river boatman and trader, William Digby, on May 25, 1825. “Lafayette” was chosen in honor of the Marquis de Lafayette, a revolutionary war hero who was touring America at the time. The location of the city plat was selected because it was the northern most point that could be reached by steamboat on the Wabash River. Lafayette was established as the county seat for Tippecanoe County in 1826, and has played a key role in shaping the northwest region of Indiana ever since. Lafayette prospered because of the developing Wabash River, Erie Canal, and the railroads. This prosperity fostered the construction of significant commercial and public buildings, many of which are largely intact and architecturally cohesive. The craftsmanship of many of the buildings is excellent. The 40-square blocks known as the downtown are a historic example of urban development in the 19th century midwest region of the United States. Since that time, the downtown has changed in many ways. Use of its land and buildings is less intense; but it is still a place of diversity, rich in human activity. There are less retail establishments downtown than earlier in the century. Some chose to move their stores to the outskirts of the city as malls and suburban areas were developed. But professional and service businesses prospered, and today nearly 125 retail and 225 service businesses can be found in the downtown area, as well as many government offices and residences. 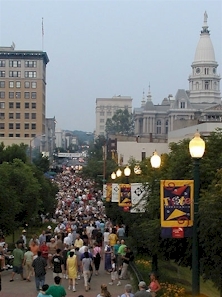 Today, downtown Lafayette-West Lafayette is the central focus of our community — the center of commerce, public service and community festivals. It provides a unique atmosphere that is enjoyed by many. We hope you enjoy your visit to downtown Lafayette-West Lafayette! Follow this links for more information about the Lafayette-West Lafayette area, past and present, and enjoy the virtual tour.